Before you read my story, let me just share one thought: nowadays, we praise success too much without telling the whole story. What you will read below are the nice parts of my journey. You will not read about me practising psychometric tests for 40 hours and finally acing them, you will not read about me rewriting my CV 100 times and you will not read about me preparing for an assessment centre until 4.00 am. What I am trying to say is that everyone can get there, but you must put a decent amount of effort into it – that’s the hard part. 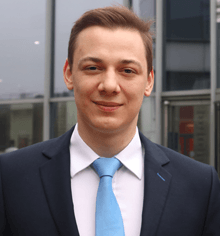 My name is Arek and I’m a second-year management student from Poland. My story begins when I was 15, but I will not go back that far. In short, I was living in a boarding school 100 miles away from home and it changed my life. A comfort zone is an obsolete idea for me. I came across the Undergraduate of the Year Competition when I was looking for a placement last year. My default mode is ‘don’t waste any opportunity’ so I decided to apply. To be honest, the three open-ended questions on the application form were a hard pill to swallow as I didn’t have much experience with fast-moving consumer goods companies. I thought to myself ‘what are the chances that I will be selected out of so many applicants?’ But I tried my best and shortly after the deadline I received an email saying that I got through to the next stage. Here, the true work began. We were invited to an assessment centre which consisted of four stages, namely: psychometric tests, making a business case, group tasks and an interview. Additionally, I was briefed on a business case where I was to negotiate a fictitious deal with one of L’Oréal’s main clients. I was really anxious about this part of the day as it was quite a high-level scenario with little supporting material. Nevertheless, I knew that practice makes perfect, so I spent a lot of hours preparing. A fun fact: at the assessment centre everyone knew me as the guy who took the 3.00 am bus from Leeds to make it to the assessment centre at 9.00 am. The trains were too expensive! I did not really expect to get as far as the interview, but I was really hyped when my name was announced. This was something unbelievable – I was sitting in the room full of the best students in the UK. The interview went quite well, but I have to admit that some questions took me aback. This made me realise that, no matter how much you prepare, interviewers will always surprise you. The week after, I received a call. A lady was telling me my scores, but I did not know if they were good or bad as I had no frame of reference. It seemed to go on for ages until she finally said, ‘you have been successful’. Then, before I knew it, I was in London sitting in a hall with a group of highly successful, motivated and skilful undergrads. Being honest, when I heard some people’s bios I felt a bit ashamed, but it was fine. I made it to the final, which meant that I was good enough. I was really proud of myself and felt that my hard work finally paid off. Most importantly, I have met the most talented people in the UK, which was a great opportunity to broaden my horizons and surround myself with like-minded individuals. I also had the opportunity to talk to L’Oreal’s Director of HR, Paul Gillam, who is an inspiring figure that shared his knowledge with us. If you were to ask me what the most beneficial things were that I gained from this competition, my answer would be: connections, connections and connections.